We’ve showed you how to haunt the inside of your house, so now it’s time to take the idea outside. 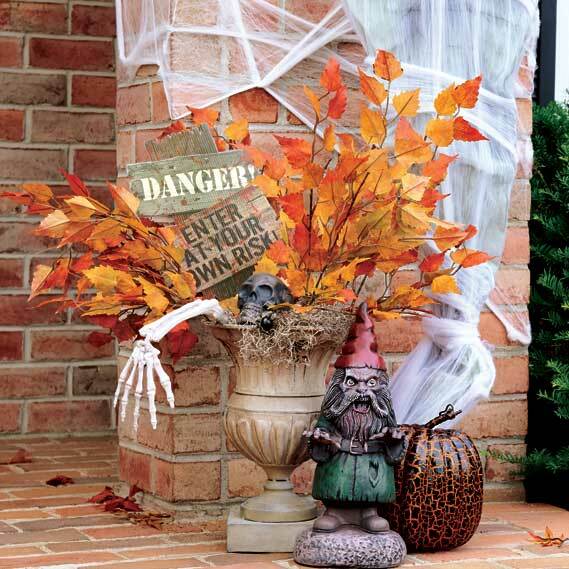 Keep reading to see our favorite outdoor Halloween decorating ideas. Entrance guests with your entrance. 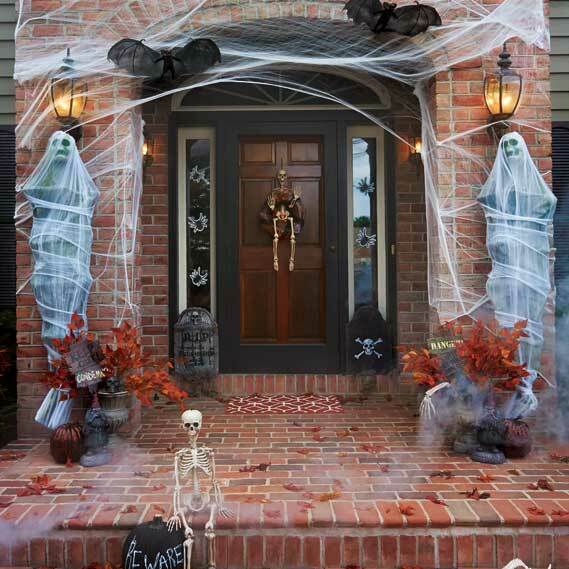 Just like we said in out last post about outdoor Halloween decorations, a decorated doorway is the first impression for your Halloween party guests, so you need to get it just right. Basic fake spider webs work well, but be sure to go all the way with it. Stretch them as thin as you can so that they look real, and put them everywhere. You’re going to need to break out the ladder. Then, blow some minds with big props. We used a couple of these spiderweb cocoon skeletons. Each one is about 6 feet tall, light enough to easily hang from just about anywhere, and looks just like a corpse trapped in the web of a giant mutant spider. Speaking of giant mutant spiders, this one has a four-foot leg span. 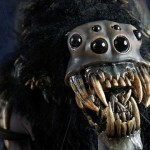 Not for the arachnophobic. 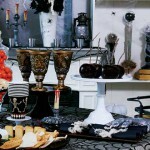 Incorporate natural items into your outdoor Halloween décor. The best part about using twigs and autumn leaves in your Halloween scene is that you probably have a whole bunch of them in your yard, and the only things better than DIY decorations are free DIY decorations. Alternately, find faux leaves and branches in your craft store’s floral arrangement section and get some that you can re-use every Halloween season. Work these items into planters and other porch decorations you may already have out. Zombie garden gnomes make an excellent addition, as do Halloween decorating staples like webs, bones, skulls, and painted pumpkins. Make a D.I.Y. Halloween wreath for your door. This is one of our favorite door decorations we showed off above. With a few simple materials, an ordinary twig wreath from the craft store becomes an awesome Halloween wreath. For ours, we used translucent pieces of orange, purple, and black tulle fabric, tied with black ribbons. A plastic skeleton prop through the middle was the perfect finishing touch. Another cool Halloween wreath idea is to make a skeletal bone wreath. 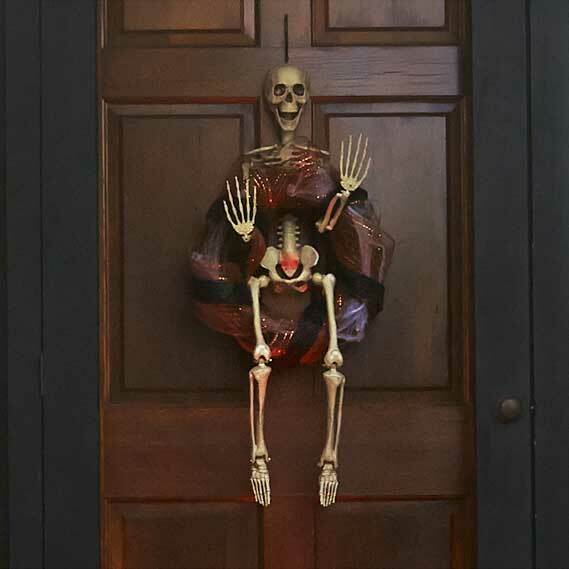 Use hot glue to attach skulls and bones to a Styrofoam or cardboard wreath (or even just a cut-out cardboard ring) to achieve a simple, yet spooky, Day of the Dead look. 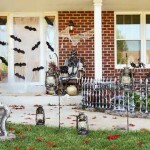 Seriously, oversized inflatable decorations like these are one of the top trends on Halloween decorating. They’re really easy to set up – just stake it down and plug in the built-in fan to an outdoor outlet – and you can instantly transform your yard into something special. 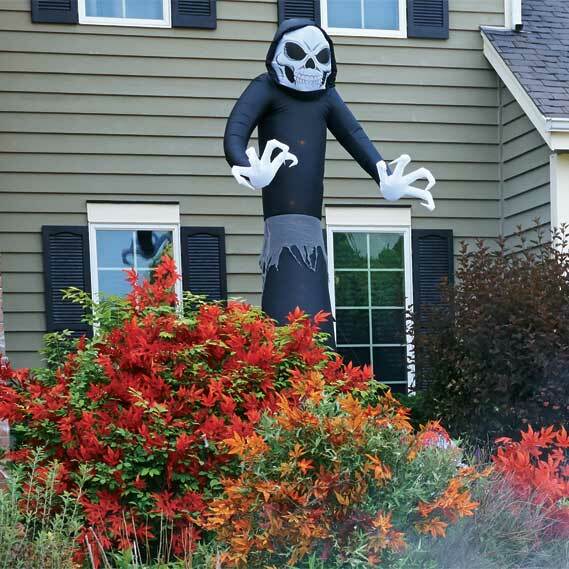 We used this giant grim reaper lawn inflatable for our Halloween scene. He’s over 12 feet tall, and lights up for a spooky appearance, especially at night. Click here to check out even more amazing inflatable Halloween decorations to get inspiration for haunting your house this season. Some of our other favorites are this classic ghost decoration and this amazing multicolored spider. 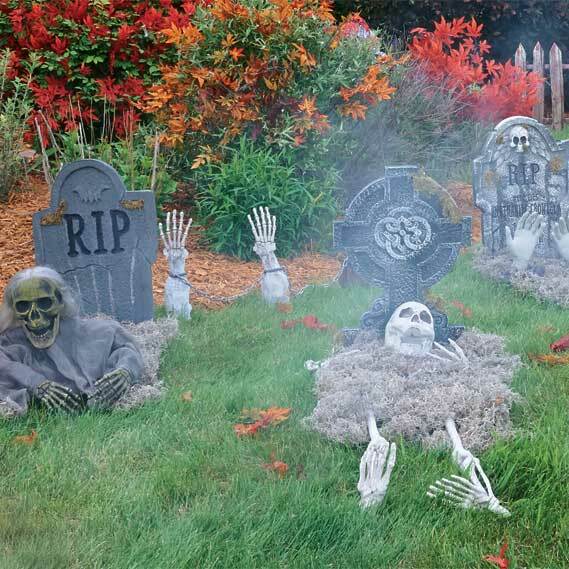 Give your garden a gruesome graveyard. With foam gravestones and skeletons, it’s easy to build a fake cemetery right on your lawn. Skewer the tombstones into the ground so they don’t blow over, and cover bones with mounds of dirt or straw to make it look like they’re half-buried, rising from the dead. A fog machine and some creative outdoor lighting can conceal the illusion even better. You can make a scene like this look really gory, with splatters of fake blood and severed zombie limbs. 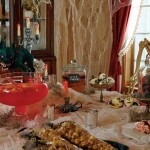 If you’re into creating haunted houses for adults, this can be the perfect addition to your decorations. Or, if you’re decorating your front lawn for all the trick-or-treaters (and their parents) to see, you can go with a tamer, but still spooky, set-up, like we’ve done here. 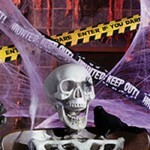 What did you think of our haunted house decorating ideas? If you liked this post and want to see more like it, then let us know what kind of Halloween ideas we should show off next – message us on Facebook, on Pinterest, or on Twitter @BuyCostumes to tell us what you think.